Wayne Rooney will miss England's 2012 European Championship group matches after being banned for three matches for his red card against Montenegro. Uefa's disciplinary panel, which described the incident as an "assault", decided on the punishment at a meeting on Thursday. 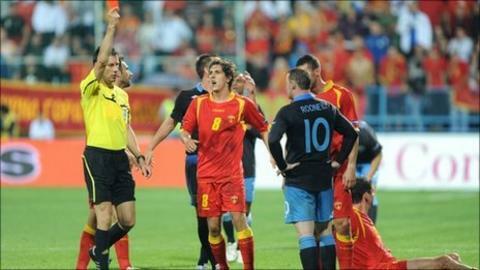 Rooney, 25, was sent off for kicking Miodrag Dzudovic in the 2-2 draw in Podgorica last Friday. It is understood the Football Association will appeal. Wayne Rooney is understood to be "shocked" and "disappointed" by Uefa's three-match ban for his kick at Montenegro's Miodrag Dzudovic. But watching replays of the "assault", as Uefa described it tonight, it's hard to see how their disciplinary panel could have reached any other conclusion. And so, once again, England's most important and talented player is facing disappointment at a major tournament. Now Fabio Capello faces a dilemma. With Rooney ruled out of the group stages, should he take him? There should be little debate. England are good enough to reach the knockout stage without him and Capello knows not selecting him might appear defeatist. BBC Sport has also learnt that Rooney is "shocked" and "disappointed" at the punishment and that he will do whatever he can to support the FA's appeal, should it choose to make one. In the Premier League, the punishment for violent conduct is an automatic three-match ban. But Uefa's policy is to suspend the player for one game, with a panel deciding on a case-by-case basis what, if any, additional punishment there should be. Instead of issuing a longer ban, Uefa had the option to hand out a warning or a fine. Officials take into account the referee's report, representations from the player and national body and the player's disciplinary history. A statement from the Football Association said: "Further to Uefa's decision to impose a three-match suspension on Wayne Rooney, the FA awaits the full reasons from the disciplinary committee, and will give full consideration to the decision internally, before deciding on any response to Uefa or making any further public comment." BBC Sport understands there is a risk that should the FA lose its appeal against Rooney's ban that Uefa could increase the length of the suspension to four games. Former executive director of the FA, David Davies, believes England would be correct to lodge an appeal. "There's no doubt that there was a feeling around Europe that this was a serious offence," he told BBC Radio 5 live. "It's been treated that way. Could an appeal possibly be described as frivolous? I don't think it could. This is a test for the FA's influence inside Uefa." Meanwhile, Manchester United team-mate Michael Owen expressed his surprise with Uefa's punishment. "Disappointing news regarding Rooney. Missing three games on such a big stage seems a bit harsh," he stated on Twitter. Everton midfielder and ex-United player Phil Neville added on Twitter: "Rooney banned for three games what a joke - if it was a Dutch, Spanish, Italian or German player they wouldn't even get one game #fact." England coach Fabio Capello said he might leave Rooney out of upcoming friendlies to study alternative attacking options with Darren Bent, Jermain Defoe, Danny Welbeck and Bobby Zamora all vying for the lead striker's role. "There's a huge incentive for four or five strikers to stake their claim to get his place - they've got a great carrot dangling between now and the end of the season," former England captain and forward Alan Shearer told BBC Sport. BBC Sport's Garth Crooks said: "We expected one [game ban]. Two would have represented a hammer blow. Three is like a dagger to the heart of the Football Association. "The message that Uefa are sending out to players is that they aren't going to tolerate any violent behaviour at the European Championships. "This is a real problem for England. Capello now doesn't know his best side. "More importantly, is he going to take him to the tournament? It would be a very, very brave man to leave someone like Wayne Rooney out. He's a top class act. The difficulty is, he has a temperament problem." Former England coach Graham Taylor said the severity of the punishment did not shock him. "You simply cannot deliberately kick an opponent and expect to get off with a one-match ban and there is always the possibility you will get three games," he told BBC Sport. "This is what has happened. I can't say I'm surprised by the decision." England Supporters' Club spokesperson Mark Perryman said he was disappointed with the "immaturity" Rooney had shown in Montenegro. "I'm gutted, absolutely gutted," he told BBC Radio 5 live. "I was there at Euro 2004 when he lit up the competition. He was petulant out in South Africa. "I was out in Montenegro, and we couldn't believe it. It was immaturity, and this isn't a guy who is 18 or 19 years old anymore." Rooney was sent off in the World Cup quarter-final against Portugal in 2006 after appearing to stamp on the groin of Ricardo Carvalho and then push former Manchester United team-mate Cristiano Ronaldo. Referee Wolfgang Stark put in his report that the former Everton man left the pitch in Montenegro without contesting the decision.